First, there was the eBay leaks, and then, the packaging. 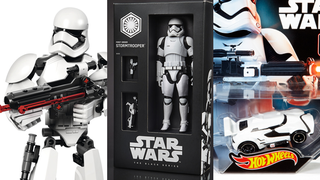 But now we can confirm that The Force Awakens’ inevitable merchandising Tsunami is beginning a little earlier than expected, with a plethora of Stormtrooper toys hitting the convention next month. Star Wars fans, ready your wallets! I actually do quite like the little mouth-grill on the front still being there. That’s nice. There’s no word on pricing for the vehicle, but EW added that it would be joining Hot Wheel’s Star Wars line at the show, so you’ll presumably be able to purchase it. But I’ve saved the best for last — even if some of the sheen is taken off by the leaks, it’s still gorgeous to see: Hasbro’s first The Force Awakens Black Series figure. The First Order Stormtrooper, who will come in SDCC-exclusive packaging ahead of its normal release on September 4th, is in the 6-inch scale and comes complete with two blasters. Retailing for $25, the toy will be sold at the convention, with a limited number then going on sale on HasbroToyShop.com afterwards for fans who can’t make it to the show. The idea of a new Star Wars movie was a bit ephemeral in my mind for a while, despite seeing trailers for it. But with actual toys landing? Now it feels like it’s happening. Oh, my poor, vulnerable wallet.